I’ve been part of Atomic for 10+ years, and it’s easy to forget some of the dreadful feelings and experiences I’ve had in other companies where transparency in financial performance was not part of the culture like it is here. Why is the boss stressing out while looking at financial documents? Is my job at risk? Will my extra efforts really be noticed? Am I being paid fairly compared to my peers? Will there be a bonus this year? If so, how much? The considerations I listed above are just a sampling of the toxic thoughts that can arise when people don’t have insight into the company’s finances. These thoughts will eventually lead to behaviors that are corrosive to culture and performance. Presented the income statement for the quarter, explaining line items in detail. Provided education about why gross margin and net margin are important and how they can be affected. Gave projections for the remaining year. Showed how the employee bonus was calculated and let everyone know what they could expect in their upcoming paycheck. Carl and company managers act ethically and run the business responsibly. I will always know how the business is doing, if my job is at risk, and how I can help maintain or improve results. I get to share in the company’s success with profit sharing. I see how profit sharing is algorithmically calculated and know what to expect in the future. I felt a sense of trust, fairness, commitment, and engagement flowing in both directions. Before this point, I didn’t think businesses were run like this. Follow the Action & Keep Score: Every employee should be expected and enabled to use their knowledge to improve performance. Provide a Stake in the Outcome: Every employee should have a direct stake in the company’s success–and in the risk of failure. Atomic continually experiments with tactics for each rule of open-book management. Below, I’ve outlined some of the current practices we use to implement them. We provide an “Economics of Atomic” class to every new Atom. It explains the financial modeling tools of the company and how to read basic financial statements like the income statement and balance sheet. The financial modeling tools are provided as a spreadsheet workbook, and real-world data is included for revenue, cost of people, expenses, utilization factors, etc. Atoms work through what-if scenarios to see how results can change based on tuning variables like billable rate, utilization, and vacation. The same financial model is used by Atomic’s managing partners to model upcoming annual financial performance. 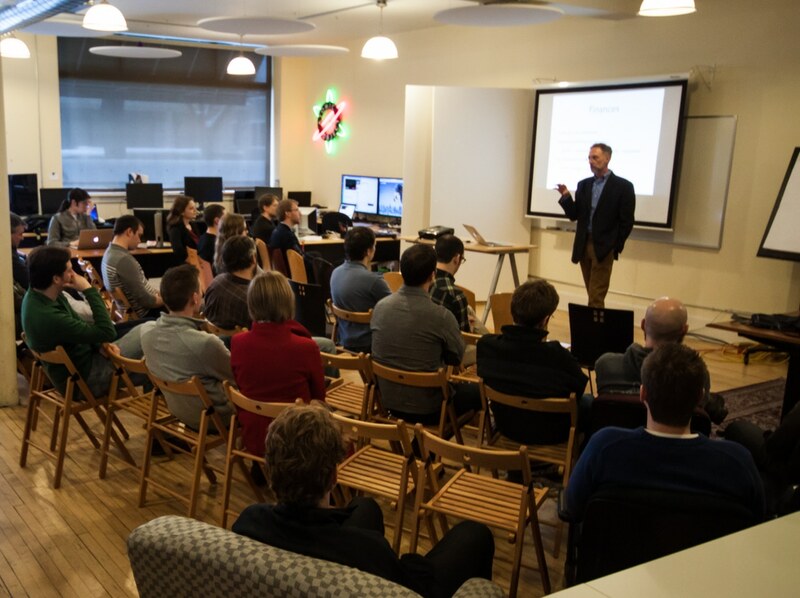 Each Atomic office holds office-specific quarterly results meetings that include all Atoms working for that office. During quarterly results meetings, managing partners review the financial performance of their respective office and overall company, and they answer any questions Atoms may have. They review high-level areas of the income statement and explain any significant variances (e.g. revenue is usually down in Q4 due to holidays, or we’ve spent more on one-off legal fees to create our employee share purchase plan). Our Economics of Atomic class and quarterly results review emphasize the area where makers at Atomic have the most control over financial results: their billable hours utilization. Atomic’s financial model is built on Atoms working a sustainable pace of 40 hours per week. In practice, the average weekly hours worked at Atomic are approximately 42. Makers know that hitting a billable hours target of 40 hours per week will drive successful results. We have created our own time tracking system, PunchIt, that Atoms use daily to track all billable and non-billable time. Everyone has an incentive to use PunchIt because it is directly tied to our payroll processing. 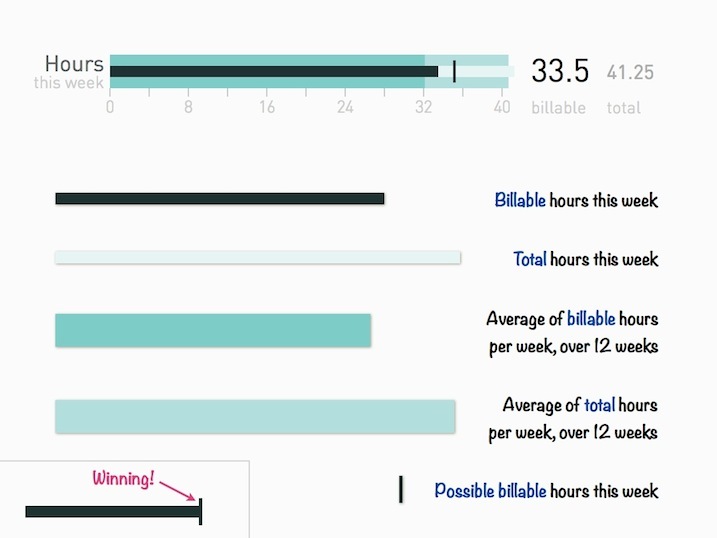 PunchIt shows makers a graph of their possible billable hours (PBH) target for the week–which may vary due to vacation, sick time, etc.–and how they are tracking against their target. PunchIt also shows makers a graph of their quarterly PBH utilization against their target. Individual PBH utilization is overlaid on top of company-wide PBH utilization of makers for the quarter. Each Atomic office has a large key performance indicator (KPI) monitor that displays several widgets related to marketing and financial metrics. Openly showing our individual contributions allows us to see how we are performing against expectations and keeps us accountable to each other. 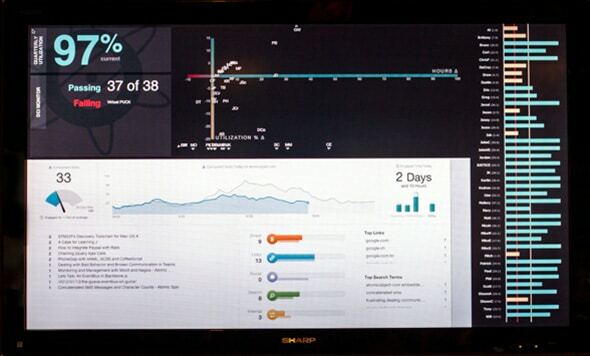 We have a widget on our KPI monitor that shows if Atoms are tracking their time daily. The widget displays a list of names for everyone in the company. If someone neglects to add their time to PunchIt, their name grows in size on the display to the point of breaking the layout. Our KPI monitor also includes a widget that shows all Atoms on a scatterplot, using quarterly hours per week on the x-axis and an offset from 100% PBH utilization on the y-axis. Atoms can see where they fall on the scatterplot against company targets and each other. Centroids representing office averages are also displayed on the scatterplot so individual offices can see how they compare. After reviewing quarterly financial performance, Atomic distributes net earnings to employees and shareholders. Employee profit sharing keeps all Atoms tuned into the overall financial performance of the company. 25% of net earnings are distributed to all Atoms though 401k contributions and cash. Cash is distributed equally amongst all Atoms. Atomic is an employee-owned company. Currently, approximately 47% of the company is owned by non-founder Atoms. Atoms can invest in the company and become shareholders after one year of employment through Atomic’s Employee Share Purchase Plan. Our ESPP holds 10% of company shares reserved for broad, employee ownership. After 5+ years of service at Atomic, some Atoms are offered the opportunity to invest in greater amounts of shares. Atomic schedules a company valuation on a quarterly basis, and this is used to calculate the price of shares. The valuation is composed of multiple components including companies Atomic is invested in, cash, accounts receivable, and a discounted cash flow (DCF) analysis of likely future performance of Atomic’s core service offering. The DCF takes historical, pro-forma revenue and net margin into account. The components in the valuation reinforce the KPIs we teach and track. Price per share also becomes a performance metric as Atoms want to maintain or increase the value of their shares. At the end of each quarter, after distributing employee profit sharing, shareholders adjust our rainy-day fund (we maintain a cash reserve based on a rolling period of expenses and cost of people) and then distribute remaining net earnings to shareholders. In addition to employee profit sharing, shareholder distributions keep all Atoms mindful of the company’s financial performance in many dimensions. I believe Atomic’s open-book management practices allow the company to run more predictably and sustainably. As Atoms, we have shared goals, measures, and expectations. Atomic’s managers are motivated to pay close attention to company performance at a quarterly cadence, speak to performance, and guide course corrections as necessary. We are invested, and share, in the results. Through this high-level of transparency, Atoms are able to have confidence in Atomic’s stability and the fairness of our financial practices. Nice article! Thanks you a lot about it! Expand my knowledge please. What can you tell me about this company?